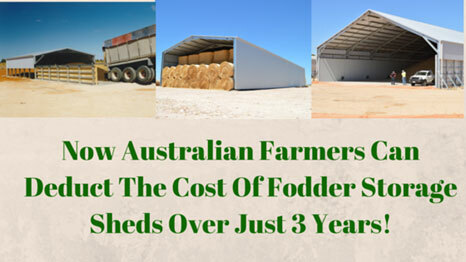 Australian Farmers can deduct the cost of Fodder Storage Sheds over just 3 Years! The Federal Government has announced new tax depreciation measures for primary producers in this year’s (2015) Federal Budget. The move opens the door for farmers and other primary production businesses to claim accelerated depreciation on fodder storage (amongst other items). Under the new measures, primary producers can deduct the cost of fodder storage sheds over just three years, instead of up to 50 years previously. So now there are many good reasons to invest in a new shed for your hay, grain, silage … anything that involves storage of fodder. *Please seek independent accounting advice to check the status of this information in relation to your own specific circumstances. Almost Paid For The Shed In One Year! And when you buy a new shed, it makes sense to invest in a farm shed that’ll do the job properly … one you can rely on to do everything you need. A farm shed back by a Rock Solid 50 Year Structural Guarantee.